Kobe is a 16 week old Rhodesian Ridgeback puppy. His owners are not only a terrific family, but are very smart and proactive dog owners. They contacted me for puppy obedience training Westchester NY as soon as they brought Kobe into their home. Starting proper training early, is one of the best things new puppy owners can do. When many owners think of what it means to be a “responsible dog owner”, they typically think of providing shelter, food, water, Veterinary care, etc. What often gets overlooked is the aspect of training. Training a puppy or newly acquired adult dog is not optional. It is our responsibility as humans, to help our four-legged family member safely and easily navigate the human world. How do we do this? Through proper training. Dogs do not inherently know the concepts of housebreaking, obedience training, staying off furniture, not barking in the house or jumping on people, etc. We need to teach them this. Kobe’s owners knew how important it is to get proper training for him early on. They realize that 6 weeks of training is an investment in not only their dog, but also their peace of mind and happiness for the next 10+ years. Regardless if you hire a trainer or not, make sure to begin training your dog now, and always use safe and proven dog training principles. Abby’s owners were struggling with her: jumping on guests, mouthing/chewing on everything, exhibiting a high level of energy, and having accidents in the home. We immediately began laying a solid foundation of structure, clear expectations, and proper exercise. Whether you are in need of puppy obedience training in Westchester NY or anywhere else, these concepts are essential to successful puppy training. Exercise consisted of both mental and physical – obedience training for mental and structured walks for physical. Abby was a huge leash puller (very strong for her age, size, and weight). However, this was something we were able to solve very quickly. Abby was also having accidents in the home. This is a frustrating and tiring struggle for so many owners. Her family diligently carried out my housebreaking protocol, enabling us to quickly solve her housebreaking problems. Abby’s owners wanted her reliable with obedience commands, so we implemented my beginner through advanced obedience program. Her owners were very dedicated to training, which was integral to Abby achieving off leash obedience using low level remote collar training. Having an off leash obedience trained dog should be every owners goal. A truly reliable dog enables you to take them wherever you want, and have the peace of mind in knowing they will listen to your commands in “real life” situations. Abby went through my complete Puppy Training Protocol and Obedience Training Program. I only use simple, safe, and effective dog training methods that work for dogs of all breeds, ages, and sizes. Regardless if you are looking for puppy obedience training Westchester NY or anywhere else, make sure you are using a safe puppy training program that is based on sound dog training principles. This is essential to developing both obedience, as well as the relationship and bond between you and your puppy. Toby is a 14-week old Belgian Malinois puppy, whose owners are very dedicated and proactive that they travel 60 minutes from NYC each week in order to train with me. All puppy owners should be proactive in establishing clear rules for proper behavior and obedience training. 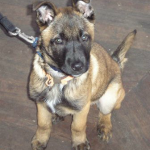 However this is even more important for large breeds and working breed dogs, such as a Belgian Malinois. 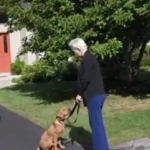 In the video above, Toby is just starting Puppy Obedience Training Westchester NY and learning how to “Heel”. This is the best way to solve leash pulling, barking or lunging at people, bikes, cars, dogs that pass by. Helping with greater puppy socialization.